Today, I want to share with you one fantastic experience helping one HR department with job interviews. In my +15 years of experience I participated in few job interview. I always had the feeling that I am getting “prepared” answers. With all the information we have in the internet, it is not very difficult to find the answer any hiring manager is looking for. 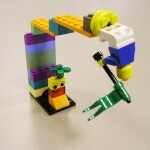 Why is LEGO Serious Play a good tool to introduce in job interviews? I don’t have a very traditional approach when I run interviews. With the time, I tried always to put the interviewee out of the comfort zone with some “crazy” question. I got it, but after few minutes, he/she came back and I continued with the same feeling…he/she knew what I wanted to listen. Other challenge: how can I evaluate soft skills?. I know, there is a lot of test to do that, but it takes time and it is not easy to do it for all companies and/or positions. Said this, I start to discuss about it with HR team, and I found that people with +10 years of experiences doing interviews had the same concerns. It was a that moment that I said, what can I do as facilitator to help with this? With all this in mind, 3 or 4 months ago I started to work in one possible solution (for sure it is not the only one). I found it very fast, but my challenge was how to present it to HR department. As the title says, I introduced LEGO Serious Play (aka LSP) to HR people. It took a little bit of time and few talks. Of course, I got some resistances, but I also got someone interested in this new way to do job interviews. He was not sure about it, but he really though that we could try it and evaluate results. I was more than happy. Transform your 1-to-1 interview in a “lean forward” job interview. Interview should not be “conducted” by someone, it should be “constructed” together…all is in one model. In the last one, after listen the feedback from hiring managers, I gave 2 question cards to each interviewer. It allows to interviewers ask 2 questions outside of the model. It works very well. I will keep it in the future. Here is a 5 min video of one of our 45 min fantastic LSP – job interview, enjoy it!! !